Using the Video Player on Blogs, Outside Sites etc. Underneath the video on the video page there should be 2 icons. 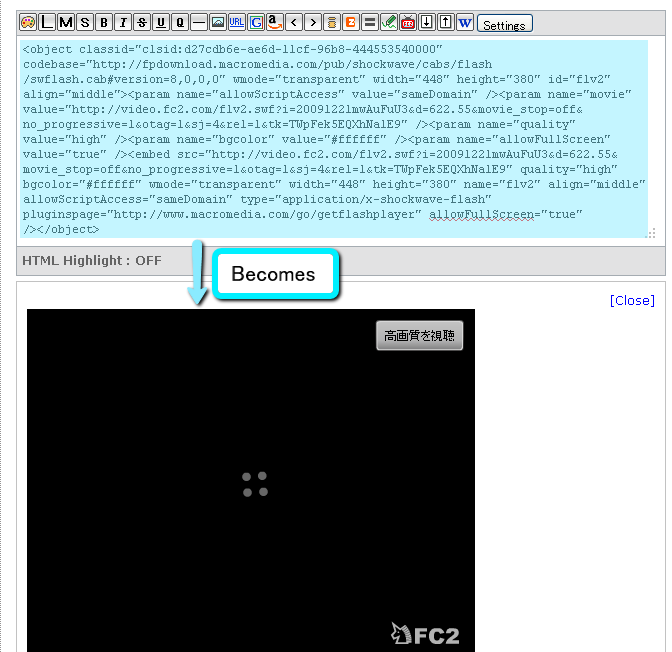 This is a simple function for posting videos on your FC2　Blog. If you push this button while logged in to your FC2 blog the "Write New Entry" page will open and the code will appear automatically in the text box. Using this function is simple and easy, however you will not be able to change the video's size or disable the "Suggested Videos" function. If you wish to modify the code please use another player's code to do so. Pressing the "Use on Outside Site or Blog" icon will display a player and thumbnail you can use on other websites. This player tag can also be used on non-FC2 blogs. Any content that a poster has not permitted to be used on outside sites, cannot have it's player code acquired. Also, any content that has been released on an outside site and then has that privilege taken away by its original poster will simply stop working. First, choose the player size. There are four predetermined settings to choose from. Or you can enter in your own custom size (based on the number of pixels). A tag code holding this information will appear. Copy the code from the text area. Everything from ＜object ... to ＜/object＞ is one player code. Losing or corrupting any of this data may cause the video to not work correctly. Please make sure you select and copy it all. All content will still be read off of FC2 Video, so if any original data is deleted the video will stop working on all sites.